Did you know...The first major effort by Europeans to study the meteorology of the Arctic was the First International Polar Year in 1882–1883. Eleven nations provided support to establish twelve observing stations around the Arctic. The observations were not as widespread or long-lasting as would be needed to describe the climate in detail, but they provided the first cohesive look at the Arctic weather. PSD has a number of Arctic focused datasets and datasets that include the Arctic region that we make available to interested users. Gridded datasets with arctic coverage including four reanalysis datasets. Gridded observed and reanalysis datasets of ice concentration. AO (Arctic Oscillation) and the NAO from the monthly atmosphere/ocean timeseries webpage. Microphysical Retrievals: Files from the North Slope of Alaska and SHEBA projects. 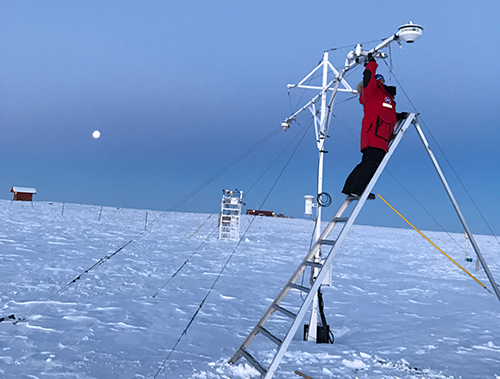 Obtain monthly timeseries from gridded reanalyses that correspond to Arctic atmospheric observatory locations. Datasets include the NARR (North American Regional Reanalysis), NCEP/NCAR I Reanalysis and the NCEP/DOE II Reanalysis. Obtain daily timeseries from the NCEP Reanalysis or obtain days that satisfy user criteria (e.g. the highest 10% of January temperatures for a grid. 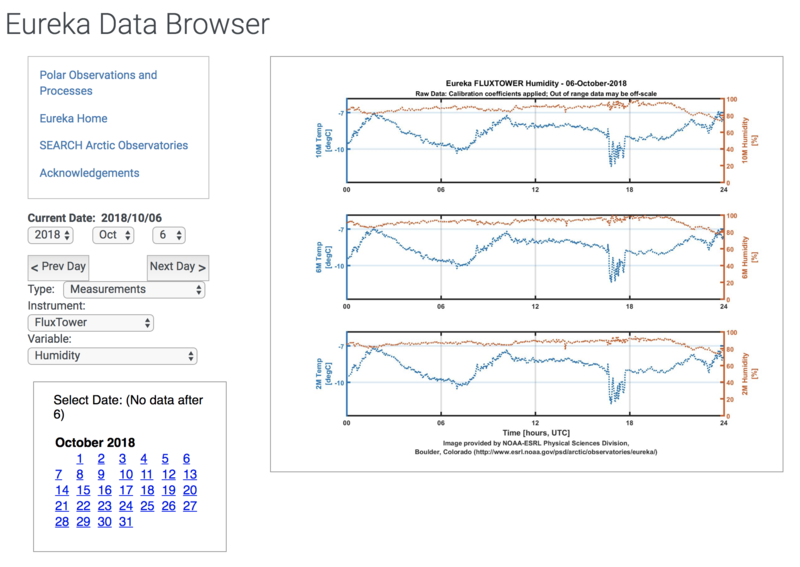 Page allows users to plot and compare index timeseries like the AO, the NAO, Nino 3 and many others. Plot means, anomalies and climatologies of data from the North American Regional Reanalysis. Different time periods can be averaged within a plot. Users can use climate timeseries like the AO to examine how the atmosphere and ocean relate to them. Plot values from the 20th Century Reanalysis which utilized surface temperature and pressure observations to drive a full atmospheric model. Dataset starts in 1908. Plot timeseries correlations like the AO with atmospheric or ocean datasets. IASOA Observatories Include: Cherskii, Russia; Tiksi, Russia; Pallas, Finland; Ny-Aalesund, Svalbard; Villum, Greenland; Summit, Greenland; Alert, Canada; Eureka, Canada; Oliktok Point, Alaska; and Barrow, Alaska.